Though the phrase “pickled seafood” may not sound so appetizing to the uninitiated, savor jeotgal, the fruits of days, weeks or even months of preparation, and everything changes . Jeotgal is salt-fermented seafood. A wide variety of seafood can be used to make it, including fish, roe, clams, oysters and tiny shrimps, as well as fish gills and intestines. When naming a specific type of jeotgal, the word “jeot” is used as a suffix. Most types of jeotgal are consumed as side dishes. Though they are not the main dish, they surely can complete the dining table. Thanks to its spiciness and sweet saltiness, jeotgal is perfect for whetting the appetite. It can be hard to identify the exact ingredient of each type of jeotgal just by looking at it, as the recipes are similar. Jeotgal is usually red and lacks a distinctive shape. The taste is similar, too, heavily influenced by scarlet red condiments. One of the most common types of jeotgal is ojingeo-jeot -- squid pickled in red chili powder. Though it may look a little alien -- a slimy tangle of shredded squid -- it has a sweet and spicy taste, and is best enjoyed as an everyday side dish. 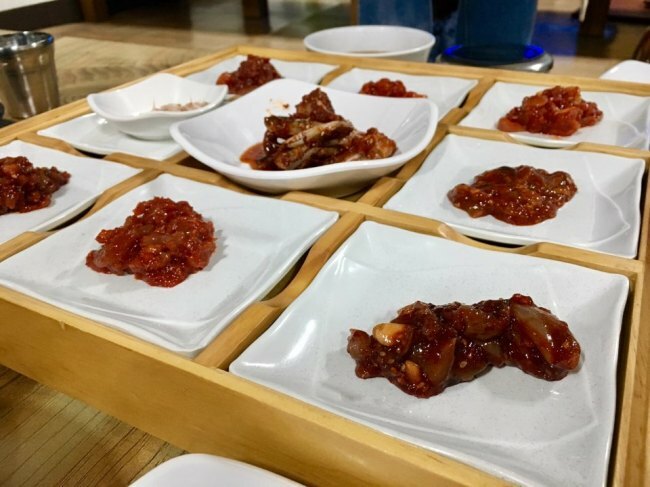 For those not quite ready to jump in with both feet, ojingeo-jeot is an easy, relatively non-threatening jeotgal option to try, as it doesn’t have a strong fishy flavor. It is often paired with rice porridge. Nakji-jeot is made with a small octopuses called nakji. It is easy to identify, as the small suckers stand out. The spices used are similar with that used to make ojingeo-jeot, resulting in a similar taste. The ingredient can also be made into another type of jeotgal, nakjissam-jeot. The octopus is cured with spicy chili powder and various vegetables including onions and Korean parsley, creating diverse tastes. Another jeotgal ingredient from the cephalopod family is kkolttugi, often referred to as baby octopus in English. Beware: some people find the head offputting. Kkolttugi-jeot is chewier than other jeotgal, and it is mixed with sesame seeds and sesame oil before serving. It is hard to tell what changnan-jeot is made of by just looking at it. You might guess it was garlic or small clams, but it’s actually pollock entrails. The dish can be cured with shredded white radish, enriching the overall mouthfeel. The texture is definitely chewier compared to other types of jeotgal. Eorigul-jeot is made with oysters. The oysters are smaller in size than those consumed fresh, with a softer and more delicate mouthfeel. Though the oysters carry a strong fishy smell, the dish is not too pungent as the spiciness coats the overall flavor. Garibi-jeot is made of scallops or shellfish with red chili powder and garlic. Myeongnan-jeot stands out from the jeotgal group because of its look. It looks like pink sausages which have not been properly processed. The fermented roe can be eaten raw or steamed. The mouthfeel greatly changes when cooked. While it is flabby and slimy when raw, the texture becomes lean and crumbles easily once steamed. The taste is savory, and much flatter compared to other types of jeotgal.